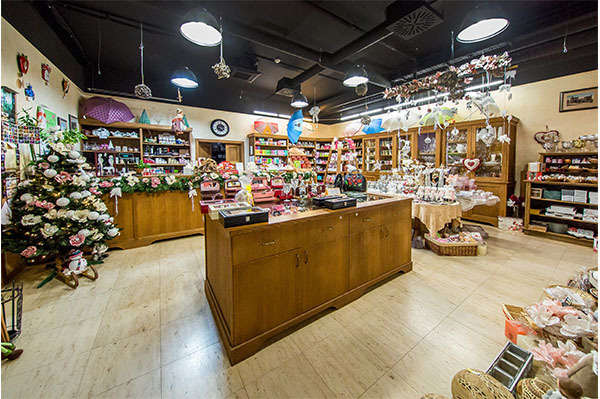 Shop | FLORIAN PALACE - RBB HOTELS s.r.o. In our gift shop we offer many different kinds of goods. Not only for your family and close relatives or friends but also for your own pleasure. We try to do the best to choose a huge range of quality products, as well as luxurios goods for hard to please customers. In our wine shop you find real gems. You can choose among a range of white and red wines being produced in Moravian region. For special occasions we offer French fizzy wines Möet, Don Perignon and Louis Roederer Cristal. We must not to forget to mention a traditional Scotch, Irish and Japanese whiskey. We also offer a wide range of archival cognacs and wine spirits. From delicacies we can offers Metaxa, Tequilla, quality rum and Russian vodka. Cigar lovers will also be satisfied. In our humidor we store moist cigars produced in Cuba and Dominican republic. You can choose from a wide range of brands: Cohiba, Bolivar, Romeo y Julieta, Hoyo de Monterrey, H. Upmann, Partagas, Don Diego, Flor de Copan, Stanislaw and others. Guillotine, a lighter or an ashtray for cigars might be the right gifts for you. Men will definetely find presents for their beloved wifes, fiancées or girlfriends. For the pleasure of a woman´s eye or for home decoration you find in your offer porcelain vases and bowls made by the Kaiser brand or glass candlestics with Swarovski stones made by the Implexions brand. We also sell Czech bevereages glass, candlesticks and vases and original hand-made ceramics or clock made by the Allen Designs brand. Women will definitely fall in love with umbrellas and manicure sets made by the Lisbeth Dahl brand or elegant jewel boxes. For your co-workers or friends we dare to recommend to buy high-quality fountain pens made by the Parker and Waterman brand, original wallets made by Vendula London brand or aromatic candles made by WoodWick brand. In our shop you can also choose from a wide range of Fairtrade tea offer – English Tea Shop. A great gift is also a delicacy in a form of chocolate truffles which are being produced by a family company Mathez. We are sure that you will be pleased by our souvenirs made by the Crystocraft brand which are interesting for their design and beautiful manufactoring. Our shop assistans will be more than happy to help you with a choice of the right gift or wrap it for you in case of need.